As usual, Thanksgiving is at my house this year and I’ve decided to update ALL my recipes to include healthier twists on my old standards. I spent the last year losing 30 lbs and I’m not gonna waste all that work over the holidays. I still want to enjoy the day, but I also want to encourage my family to be healthy and happy. Witha little effort and research I’m plan to create feast that they’ll love but won’t pack on the pounds. 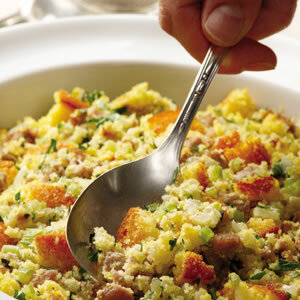 We’ll start with the cool Cornbread & Sausage Stuffing Recipe I found through the – ACE Healthy Recipes – published by American Council on Exercise. It doesn’t have all the butter and cream, which cuts the fat by two-thirds. Plus, its much lower in sodium, than my old recipe. Gobble Gobble everybody.